Forests must be protected and conserved for Viet Nam’s sustainable development, Deputy Prime Minister Trinh Dinh Dung said yesterday, emphasising it as the most important task of the national programme on sustainable forestry development from 2016-20. 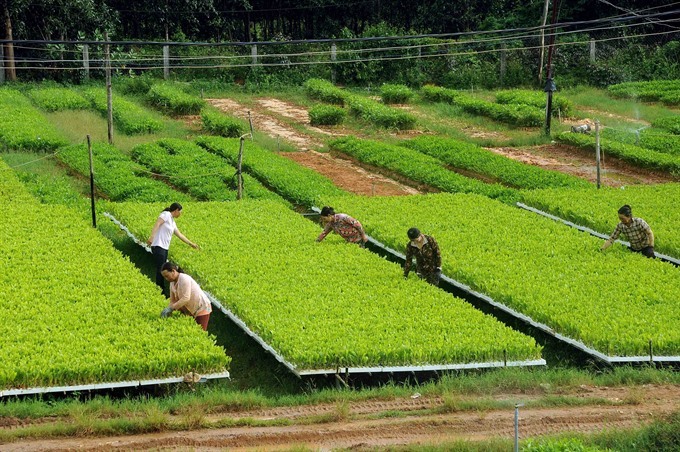 Seedlings are nursed at the garden of Hoa Don Ltd Company in central Binh Dinh Province for forestation. The programme is one of 21 key national programmes and is the continuation of various forest protection programmes since 1992. The sustainable forestry development programme that was launched yesterday is expected to help improve productivity and values of forests, increase income for forest workers and ensure national security. The programme also aims to help Việt Nam better respond to climate change, reduce natural disasters and protect the environment. By 2020, Việt Nam expects to achieve yearly forestry production growth rate of 5.5-6 per cent, forest area to account for 42 per cent of the country’s land, artificial forests to generate average production of 20cu.m per hectare per year and exports of wooden and forestry products to bring revenue of US$8 billion. Forests are expected to provide stable jobs for 25 million people. About VNĐ59.6 trillion ($2.6 billion) will be pumped into the programme, of which VNĐ9.5 trillion ($417 million) will come from the State-budget. Deputy PM Dũng asked relevant agencies and localities to improve legal frameworks, plan and implement initiatives to create favourable conditions for forest protection and development. “Each locality should develop its typical forest products which are given priority for investment and protection,” he suggested. Localities were asked to engage the whole of society in protecting, managing and exploiting forests effectively. For example, all economic sectors, both public and private, can invest in forests. Organisations, communities, families and individuals could be allocated or rent forest land so that forests are managed, helping to form material-growing zones or processing zones. Forestry production must be in a chain from forestation, material purchase, processing and consumption, he said, adding that the Government must offer support mechanisms for medium and large enterprises which play a key role in supply chains. “Enterprises can help forest farmers with products, technology transfer and to seek markets for final products. Enterprises should be placed at the centre of the production supply chain,” Dũng said. According to the Ministry of Agriculture and Rural Development, last year, Việt Nam had about 14 million hectares of forest, accounting for 41.19 per cent of land area, an increase from 39.7 per cent in 2011. About 1.2 million families or almost 5 million people do forest-related jobs. Export value of wooden and other forestry products during 2011-15 reached $6.52 billion per year on average, 2.3 times higher than that of 2006-11. In 2016, the revenue reached $7.3 billion. Additionally, the government collected more than VNĐ1.2 trillion from forest environment service fees. Chairman of the National Assembly (NA)’s Security and National Defence Committee Võ Trọng Việt on Thursday said at the NA Standing Committee’s discussion on the draft revised law on Forest Protection that Việt Nam had lost too much timber and valuable forestry products because of deforestation. “Forests in Việt Nam were said to support Việt Nam in fights against enemies but now, forests help illegal loggers get rich,” Việt said, strongly criticising deforestation. He said that the revised law must offer stronger a legal basis to stop illegally-logged timber passing by forest guard stations and to stop localities from changing the use of forest land to land for logging. In other countries, for example in Laos, when a tree is chopped down, another tree must be planted to replace it. If not, the loggers are in violation of the law. However, in Việt Nam, on average for every 10 trees chopped down only one new tree was planted, he said. NA Vice Chairman Phùng Quang Hiển said that the revised law must clarify rights and responsibilities of those who own or are allocated forest land. Forest development policies must ensure forest farmers earn enough to live, then they will be willing to protect and develop forests.